← You’re all bitching about something you choose and don’t pay for? 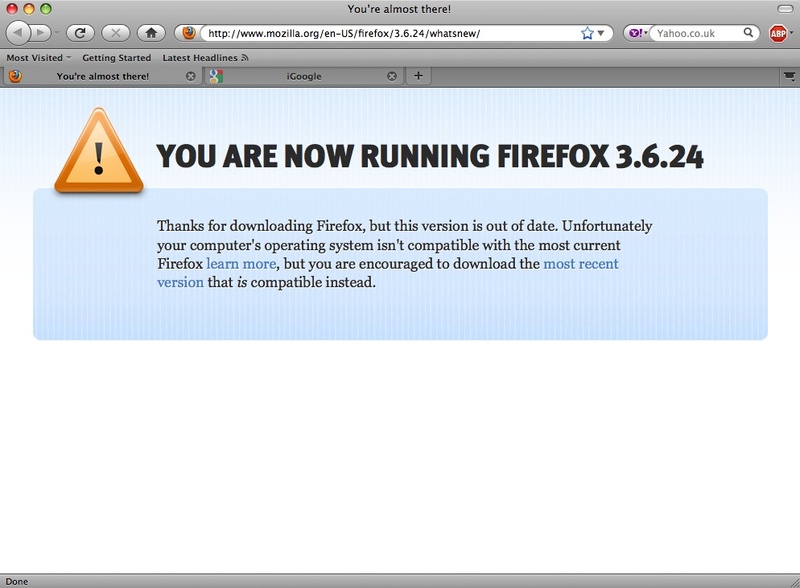 Here is a screen shot of the message I got after I upgraded Firefox to v3.6.24 a couple of days ago. This is latest version that runs on this computer and I cannot upgrade to a higher version. This is because Mozilla have chosen to drop support for PPC macs from v4 onwards. See anything wrong with the message? Remember, this is the highest version of Firefox that will run on this computer. This entry was posted in Uncategorized and tagged 3.6.x, Firefox, forehead slap, morons. Bookmark the permalink. “but you are encouraged to download the most recent version that is compatible instead”. The version of Firefox that I have just downloaded is the most recent version that is compatible. So it isn’t about ambiguity. It is a good example how programmers get it wrong when writing routines to automatically create messages from standard sentences. A perfect story for GOM everywhere. 🙂 I’m not, however, sure it *is* ambiguous. Or necessarily needs to be interpreted thus. They “encourage” you to do what you’ve done – they’re saying you should, in their mind, go ahead with what you want to do/stay faithful to that choice even though it’s not the latest version of Firefox you can get for other op systems. The information, then, is there to prevent you from giving up on Firefox all together. To download, *despite* their obligation to inform it’s an old version. This isn’t programmer-speak but marketing-speak. A “sales” mentality if there ever was one. Of course it is marketing speak. 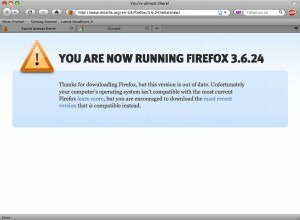 Firefox are desperate to get all users off the 3.6.x branch and onto their “improved” rapid release versions. But, given that they can identify the version of MacOSX and the CPU I am using I would have thought that they could have tailored the message more appropriately to users like myself. It is a different matter if they only check the version of the OS and the processor architecture and use them as separate bits of information. The information about the OS generates one line of the message, the details of the CPU architecture generates the next line, rather than both pieces of information being used to generate a single coherent sentence. (Just to be clear, it isn’t the version of the OS that is the problem as such, but the combination of CPU and OS. An Intel Mac running Leopard can use later versions of Firefox, a mac with a PPC CPU running Leopard can’t).